While the bare bones of this plan have been public knowledge for some time, Musk and the company he founded to reinvigorate space exploration have been somewhat scant on the details. But thanks to a simulation created by Prof. Mark Handley of University College London, the world may finally get an idea of what Starlink might look like. Handley, a professor of networked systems at the UCL’s Department of Computer Science, used a 3D game engine to create a custom-build simulator specifically to show how Starlink could work. He also included information from SpaceX’s public FCC filings, along with his own extensive knowledge of how computer networks function. In November of 2016, SpaceX filed an application with the FCC for a license to operate this constellation of non-geostationary satellites (NGS). According to their filing, the plan was to initially deploy 4425 satellites to orbits of between 1100 and 1300 km (680 and 800 mi). SpaceX has since indicated that they will be deploying their first 1600 satellites to an altitude of 550 kilometers (340 mi) to avoid adding to the space debris problem. According to the Online Index of Objects Launched into Outer Space (OSOidx), which is maintained by the United Nations Office for Outer Space Affairs (UNOOSA), there are currently 4,857 satellites in orbit of Earth (as of November 9th, 2018). Under their initial plan, the deployment of the Starlink constellation would nearly triple this number, whereas the current plan would double it. According to Musk’s plan, Starlink will send messages via a series of ground stations that will transmit information through radio waves to the satellites above. These satellites would then relay the messages using lasers it reaches the one above the recipient’s destination, where the data would then be beamed down to the correct station using radio waves again. Given the ambitious nature and technology involved, Handley was both intrigued and mystified about how such a satellite network would work. For example, he wondered if it was possible to connect thousands of LEO satellites into a configuration that would allow for internet traffic to take the most direct paths. 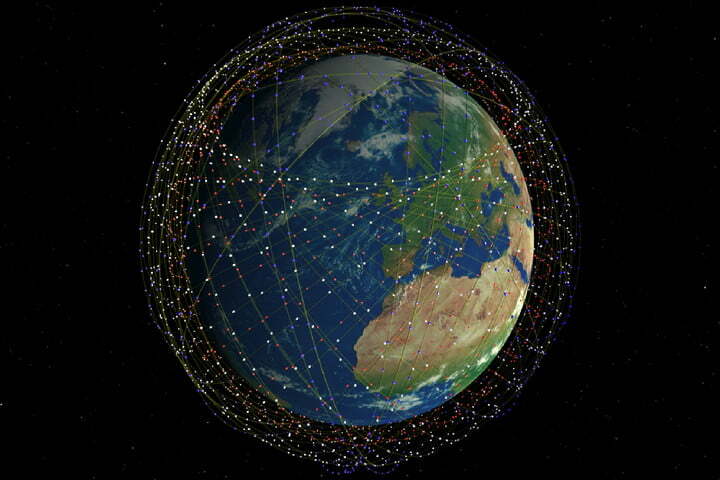 In addition, the satellites would need to be arranged in such a way that would minimize the chance of collisions. Hadley was also curious about the network’s capacity, particularly how it would compare to more conventional high-speed internet technology that relies on optical fiber. Theoretically, Starlink will be able to send message twice as fast as optic fibers, since signal speeds are slower when transmitted through glass than through space. A number companies are deploying satellites to create space-based internet services. Credit: AMNH. Hadley is hardly alone in recognizing what a challenge building and maintaining a constellation like Starlink will be. For starters, the cost of launching a single satellite will be in the tens of millions of dollars range, and maintenance costs per satellite are also likely to be huge. Each Starlink satellite will probably only last a few years in orbit, so SpaceX will need to launch new satellites regularly. However, the existence of this constellation will also mean global coverage, with access possible from remote villages, ships at sea, and other locations where traditional infrastructure does not exist. The simulation also reveals that there will be more satellites and better coverage at latitudes between 47° and 52° north and south, which coincides with the locations of some of the world’s largest trading centers. And SpaceX is not alone when it comes to the development of space-based internet. Telecom and aerospace giants Samsung and Boeing are also sending internet satellites to orbit, while Google and Facebook are pursuing their own plans for space-based internet. The Canadian telecom company Telesat is also developing a global constellation of internet satellites, known as Telesat LEO. These and another service providers will be attempting to meet the growing demand for high-speed internet access, which is expected to double by 2020. In that same year, the number of devices connected to IP networks is projected to outnumber the global population by a factor of about 3 to 1 – that’s over 20 billion devices! While providing for this demand is a major undertaking, Musk has never been known to shy away from a challenge. In the end, Starlink is like any other venture Musk has undertaken, like developing commercially-viable electric cars, reusable rockets, and spacecraft capable of transporting passengers to Mars. Who knows? Perhaps Starlink will be an additional revenue stream that could help finance the construction of Mars Base Alpha!